Shelly has created the cutest way to serve milk and cookies for Valentine's Day. These cute heart shaped cookies have been pierced by Cupid's arrow, which conveniently happens to work as a straw too. This Valentine's Day milk and cookie treat would be the coolest after school snack for my kids. 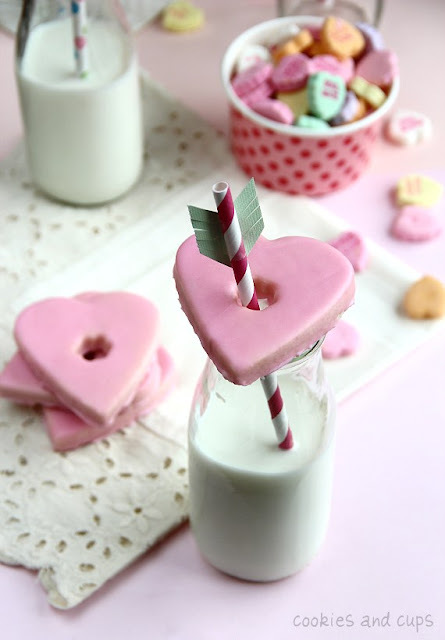 Check out how to make these Valentine cookie milk toppers over at Cookies and Cups. This is the cutest idea! I already have the red/white straws to work with! TFS!